We meet at 7.30pm on the first Monday of each month in the upstairs room of The Harlequin Pub, 108 Nursery Street, Sheffield S3 8GG. A real-ale pub with ample nearby parking, and evening meals available from 6:00pm if you wish to eat before the meeting. Directions, parking and public transport details are at the end of these notes. To raise monies towards Peak Rail projects, pay for sandwiches at the interval, and to cover speaker expenses, we request a £3 donation on the door. Members and non-members most welcome! 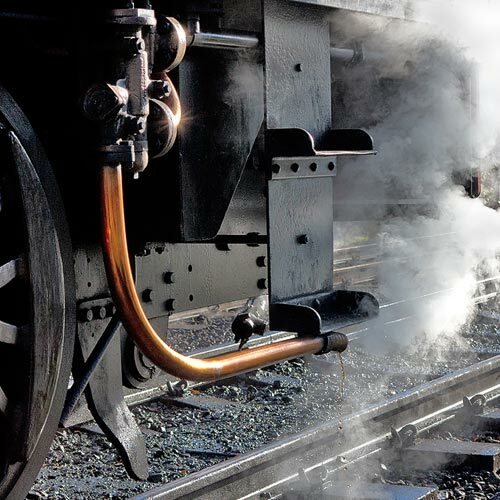 Sit back and enjoy Ted’s films of steam in the landscape, and the stories behind them. There is a memorable sequence filmed from a helicopter showing ‘Tornado’ with wonderful exhaust trail sweeping its train along the scenic Cumbrian Coast against a backdrop of the Lakeland hills. Ted was joint author with Ken Horan of the ‘On Parallel Lines’ photo books. More from Rob’s ever-expanding collection of archive railway film. Library Theatre, Tudor Square, Sheffield S1 1XZ – Start 7.30pm (doors 7.00pm). The title gives Les plenty of scope for a hugely varied presentation of his high quality pictures of the steam era, preservation, railtours, and modern image, both at home and abroad. Should be plenty to suit everybody! 2019 marks 60 years. Back to the origins, then tracing the progress through to present day. Mike, a regular visitor to France, takes us on a tour, by SNCF and tourist trains, along the Rhone Valley, Cote D’Azur, through the Pyrenees, Atlantique coast and Massif Central. His presentation includes the landscape, historic towns and tourist sights en route. Tramways and archive steam are also included. Join Gavin on another rail journey of epic proportions. Experience trans-european travel commencing in Melbourne, Derbyshire, and conclude the adventure many miles and loco classes later at Melbourne Southern Cross station, down under! Martin first started at Leicester Central MPD in 1959. Over the past 12 months Martin has been re-calling interesting and humorous incidents from his 40 years of train driving, and finding appropriate photos to illustrate them. Anthony’s show begins with some very scenic shots of trains on Yorkshire viaducts, some obtained by rather devious means to get a clear view! Then the audience gets to choose from a menu of around 30 topics (steam, East Anglia etc) each including approx 20 pictures and taking about 10 minutes, before returning to the menu for another choice to be made. Every show is different! Another show, another theme. More of Rob’s archive railway film. By Road: The pub adjoins Junction 9 “Bridgehouses” at the northern apex of the Inner Ring Road, providing direct access (follow A61N Barnsley) from the Sheffield Parkway link road from M1 (J33). The postcode of the pub is S3 8GG. Parking: After 18:00 patrons of The Harlequin have free parking in the large Aizlewood’s Mill car park. This parallels the Inner Ring Road, and is just behind the pub. Access is from “Spitalfields” which is the lane along the nearside of the pub, and which is immediately left upon leaving J9. Rail, Tram & Bus: At Sheffield railway station the footbridge gives direct access to Supertram. Take any tram from the nearest platform for just one stop to Fitzalan Square. There you turn right and continue 400 yards down Haymarket and Waingate to the bridge over the River Don (“Lady’s Bridge”). Immediately over the river, Nursery Street is first left and the pub is at the far end on your right (an easy 10 minute walk). High-frequency bus routes 3, 7, 8, 8A, 83 and 83A have stops right outside the pub in both directions, and other City Centre bus stops are just 5 minutes walk away. From Argos, Wilkinson’s or the former Castle Market, pedestrians can use the signed “Upper Don Walk” which starts just 100 yards down Bridge Street from Lady’s Bridge, and is to the rear of Snig Hill Police Station. On the Walk, the pub is visible from the bowstring river footbridge.